Twenty-three days until the election, but my top priority is still doing our city’s business on your behalf. Both topics are covered below today! The annual Surfing Madonna beach run on Saturday was the highlight of our week! 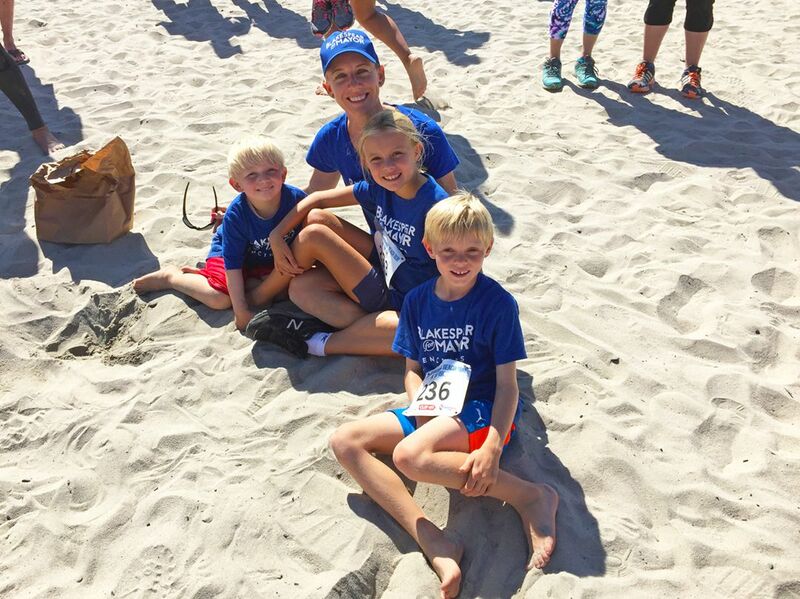 Happy families running on the beautiful beach at low tide — is there anything more quintessentially Encinitas? Here we’re enjoying a break before running the 5k and awarding medals after the event. Thanks to the Surfing Madonna Oceans Project for creating this fun, community-enriching tradition. At the City Council this week the most controversial issue involved what to do with Leucadia Towing, a longtime local business that has been operating out of the Pacific View school site without the required permits for years. The well-intentioned owner has been trying to find another Encinitas home for his local business and was hoping we’d allow him to stay for up to two more years while the permits are being processed for his possible move to a county-owned site behind the sheriff’s station on a former landfill or elsewhere in the city. Leucadia Towing’s current lease agreement on Pacific View expires in three months. The City Council was considering whether to give them a 30-day notice to vacate the property, based in part on complaints about noise and late-night disruptions, and in part on the length of time we’ve already given Leucadia Towing to find a new home. The public speakers — both residents and local business representatives — exclusively supported the continued operation of the tow truck business at Pacific View. After a healthy discussion, the City Council opted to allow Leucadia Towing to finish its current three-month lease but to restrict its night-time hours of operation. I hope Leucadia Towing can find a new Encinitas home, but the ongoing use of Pacific View for a tow yard is incompatible with a site that needs to transform as quickly as possible into a thriving arts center. The company doesn’t have the required permits and wouldn’t be likely to get them because of the adjacent residential neighborhood. Allowing the current lease to expire with the express understanding that it won’t be extended, while limiting nighttime towing activities, seems like a good compromise. The City Council discussion of this item was a great example of working together to craft a consensus-based solution, with no acrimony and clear forward progress. The issues that divide the City Council often get the most attention. But it’s worth recognizing the majority of issues in which the five of us work together amicably. Accepted a $322,000 grant to continue with the Cardiff Beach Living Shoreline Project, which will re-establish native sand dune habitat between restaurant row and South Cardiff State Beach. This will help protect against coastal flooding and reduce the damage to Coast Highway from high-swell storm surges, as well as creating a living beach ecosystem. Approved a $1.5 million landscape maintenance contract with Excel Landscape to maintain all of our parks, beaches, trails, parkways, medians and city-owned facilities. The contract includes trash-pickup, irrigation maintenance and repair, plant replacement, mowing, trimming and other landscape services, as well as the organic maintenance at Glen Park. On another topic, here’s an excellent letter to the editor by Encinitas Deputy Mayor Lisa Shaffer about why Encinitas should pass Measure T. And here’s an article about yet another lawsuit we’ll be facing, from two lawyers who have repeatedly sued local governments, if we don’t pass Measure T.
Last week my mayoral opponent and I participated in the only live campaign forum to feature a head-to-head matchup. I was very happy to see a return to civility and a respectful tone, which allowed the 100-person audience to focus on substance over emotional attacks (as heard in this recent KPBS radio interview). Some might have been expecting mud-slinging, especially given the ugliness coming from the Trump campaign at the national level. I was pleased and relieved that we took the high road here in Encinitas. At the city government level, the services provided are essential to our daily lives and citizens have true community connections. Local government is the most trusted level of government, I believe, because accountability is so immediate and both the politics and the personalities of the candidates are so intimately accessible. Town hall forums form the bedrock of our democracy, where residents pose pressing questions to future city leaders and citizens are able to assess both temperament, policy positions and a candidates ability to weigh competing values. I believe passionately in the need to nurture and protect our democracy, and I feel fortunate to sit at the table and articulate views about the bright future in our city. Here are stories on the forum from the Coast News and Encinitas Advocate, plus an op-ed piece written by an attendee. With 23 days until the election, I feel optimistic about my prospects for becoming our next Mayor. I’ve given 110% to this effort for many months, including meeting voters in people’s living rooms several times a week, walking door to door, distributing signs, raising money and continuing to serve the community by making sound and reasoned decisions weekly on the Encinitas City Council. Here’s a link to our under-two-minute campaign video showing awesome footage of Encinitas, plus my thoughts about our future. And here’s a 10-minute local access television interview about future housing in Encinitas. It’s critical that we sprint all the way through the finish line in this one, continuing to spread the word over email, through friend and family networks and over social media about the importance of the Mayor’s role in setting a forward-looking agenda for the city and having a positive, accessible leader as our city’s next Mayor. Please click here if you’d like to walk neighborhoods with me (or to get a free yard sign delivered) during these crucial final days of our Mayoral campaign! We’ll get back to you with a list of times you can participate. Previous Post10/9/16: Talking About Civility and DemocracyNext Post10/21/16: Help us Preserve Our Paradise!